The humble weather symbol 40 years on Jump to media player Forty years since weather symbols were introduced to BBC forecasts, BBC Weather's John Hammond looks back at the evolution of how the corporation has presented the weather. Dangers of flying a Met Office plane Jump to media player Scientist Joss Kent and BBC Weather's Peter Gibbs discuss the dangers of the flying the Met Office Civil Contingency Aircraft. Look around a Met Office plane Jump to media player Joss Kent, the scientist behind the development of the Met Office Civil Contingency Aircraft, takes Peter Gibbs on a tour of the plane. Happy birthday weather forecasts Jump to media player On 1 August 1861 the Times newspaper published the first ever weather forecast. Graham Satchell looks back at the history of a famously difficult art. 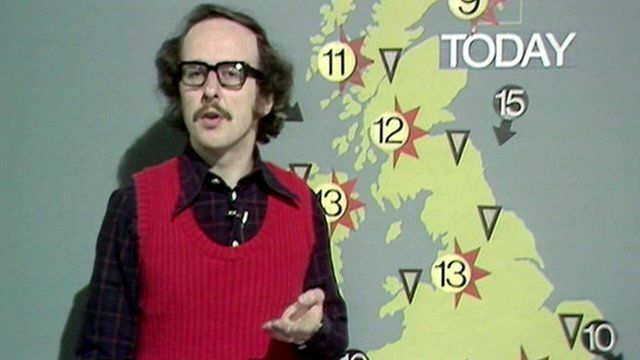 It is 40 years since weather symbols were introduced to BBC forecasts. They were designed to give viewers a clearer understanding of what weather was on the way. Over the years the style and technology of forecasting has changed considerably. BBC Weather's John Hammond has been looking at the archives.